Toxin metabolites are stored in the fat cells and remain there until the fat cells are burned for energy. When the fat cells burn, the metabolites gets released back into the bloodstream to be filtered by the kidneys and deposited in the bladder to be released in the urine. 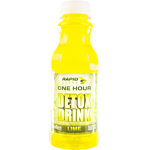 Rapid Clear Detox drinks are used to hold toxins in your body allowing you to release a toxin free. Detox Booster capsules are designed to be used with detox drink only, for increased performance. 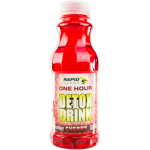 16 oz Cherry version (for individuals under 200 lbs) Over 99.87% effective and 100% undetectable. 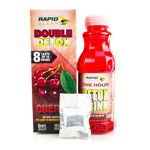 Double Detox (for individuals over 200 lbs) Effective for up to 8 hours and 100% undetectable! 6 oz Lemon version (for individuals under 200 lbs) and is 100% undetectable.